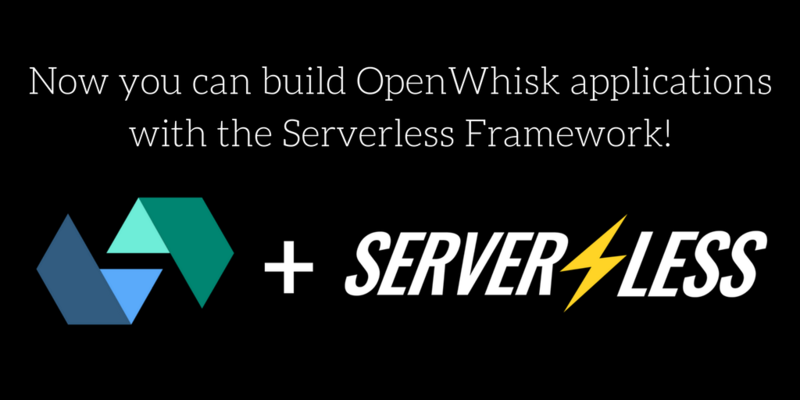 Today we're excited to announce OpenWhisk integration with the Serverless Framework! The official OpenWhisk Provider Plugin allows developers to build applications for the OpenWhisk cloud platform using the Serverless Framework. Special shout out to James Thomas (@thomasj) at IBM for his awesome contribution spearheading this effort. The Serverless Framework enables developers to use a simple manifest file to define Serverless functions, connect them to event sources and declare cloud services needed by their application. The framework then deploys these Serverless applications to the cloud provider. Multi-provider support was a goal we laid out following the Serverless Framework v1 release. With the OpenWhisk integration, developers using the framework can choose to deploy their Serverless apps to any OpenWhisk platform instance. Further, multi-provider support simplifies the process of moving applications between cloud providers and enables the development of multi-cloud Serverless apps. The Serverless workflow and developer experience is consistent across all providers. You don't need to learn custom commands or syntax for each platform. Check out these resources to help you get started with OpenWhisk integration. Learn more about how to use the Serverless Framework with the new OpenWhisk provider plugin in this quick video. OpenWhisk is now included in the Serverless Docs. You'll find a guide to building Serverless applications, CLI command reference, platform event support and an example application. Check out the Serverless Examples repository to see more sample applications. OpenWhisk examples include: how to build HTTP APIs, cron-based schedulers, chaining functions and more. For months we've been collaborating with the OpenWhisk team to ensure a great user experience and seamless integration. Let us know what you think. Community feedback is a driving force in the direction of the Serverless Framework. You can report bugs or request features by opening an issue in the Serverless-OpenWhisk repository. Join the conversation in the Serverless forum, chat room or this Slack channel for OpenWhisk. We're excited to hear your feedback. The roadmap includes support for non-Node.js runtimes, ensuring compatibility with popular third-party plugins and integrating new features from the platform. Jared Short has joined the Serverless, Inc. team as Head of Developer Relations and Experience. Here's why. What's new for Serverless plugins? Being a Serverless plugin author has never been easier. Take advantage of these awesome new features to write your very own plugin.